If only those poor companies weren't forced to keep their employees living in poverty. Thanks Obama. and Russia-linked operatives that we know about so far is 102. You choked out a good business climate with over regulation, and then wonder what went wrong. What exact regulations are you referring to? You don't know Salty? I'd say stop playing dumb but I'm not sure you're playing. Pass a law requiring all future light bulbs to meet certain high standards. Then pass laws that all the producers of light bulbs and the providers of raw goods must meet impossibly high standards. And bingo! No more light bulbs manufactured in the US. The place where the light bulb was born. The pollution hasn't gone away, just moved out of sight. Next up, subsidies to other countries cope with their pollution problem resulting from light bulb production. Im pretty sure that was passed by a republican congress. Unless your thinking of something else. Can you elaborate? The earnings loss has been around a LOT LONGER than Obamacare. THIS is why I know the right aren't serious about dealing with such problems. They just want to blame it on their political opposition while giving absolutely no look at the actual underlying problem or its history. Government actions of long term economic significance literally take decades before the impact is fully realized. Significant immediate government economic actions have a short durations. An example of a immediate impact government action was the 2009 Stimulus package. The total of about $400 billion in spending had an impact of about two or three years at the most and after that the spending had no significance at all. We're addressing a long term trend and the basis for it goes back 20-30 years or more. When looking at the chart on productivity v wages the divergence in 1973 can be traced back to 1947 and the Taft Hartley Act, a Republican law (over-riding a Truman veto) that significantly reduced the powers of organized labor. The last union contracts that were able to keep compensation based upon productivity had been in about 1968-69 (the contracts run 4-5 years) and by 1972-73 the compensation under union contracts lost the connection to the productivity but even that wasn't the full impact of Taft Hartley. It wasn't until 1981 when Reagan used Taft Hartley to fire the air traffic controllers that Taft Hartley had it's full effect of fundamentally destroying the power or organized labor. Returning to the chart because 1973 was a year of great significance when we look at compensation it also reflected the dying influence of the FDR and Truman administrations impact on the economy. The economic policies from 1933 to 1952 under FDR and Truman reached their full potential in the 1950's and 1960's and then began to fade by 1973 as the Republican policies beginning in 1947 with Taft Hartley began to take hold. The Millennials income problems of today aren't from anything that the Obama administration has done and, in fact, the Millennials problem has existed throughout the Obama administration so it's obvious that Obama had nothing to do with it. We need to look back to what significant economic policy changes occurred 20, 30, or perhaps more years ago. So what was the most significant government economic policy action(s) that occurred somewhere between 20 and 40 years ago? When answered, and we all know the answer, the root cause of today's economic problems of lower income for the millennial generation when compared to the Boomer generation has been identified. The mistake is believing that manufacturing is the key to the economy because it's not. The attachment shows that industry, that includes the sub-category of manufacturing, employed the least number of people when compared to agriculture and the service sector until about 1910 as agriculture jobs in the US per capita plummeted. The Service sector has always provided the most jobs for Americans and today the service sector represents almost 80% of all jobs. When we talk about "productivity" it's not limited to the manufacturing of goods and that's literally a small percentage of the entire productivity. The production of "services" and "goods" are represented by the GDP. Industrial output only surpassed service sector output in the United States for a short period of time in the 19th Century (see 2nd attachment). if we wanted to address the "greatest job loss" then why aren't Republicans focused on increasing the number of agricultural jobs? People used to earn a good living farming in the Unite State just like people earned a good living in manufacturing. So why not focus on brining back good paying farm jobs because they represent the greatest job loss over the last 100 plus years. Here's the facts about manufacturing. New ideas for reviving American manufacturing seem to appear every day. Many of these notions have merit, but most are built on a flawed premise: that the decline in U.S. factory jobs is a recent occurrence, one that can be reversed through tax cuts or trade policy. Unfortunately, U.S. industrial decline is a long-run phenomenon and will not be reversed by short-term fixes. To understand the long-run decline in industry, we need to look at the periods before and after World War II separately. Before World War II, the service sector grew because we got richer. Think about it: From domestic servants to waiters, blacksmiths to cobblers, and barbers to bankers, Americans have always been engaged in a variety of service activities. And, as the American economy grew and average incomes increase, Americans increased their demand for meals, repairs, grooming and financial services. Thus, more and more workers were pulled into the service sector by this increasing demand. When we look at the post-World War II data, a different story emerges. First, productivity grew rapidly in industry, faster than the demand for industrial products, while productivity grew relatively slowly in the service sector. This meant that we needed fewer industrial workers and thus many workers were pushed out of industry. At the same time, we were still getting wealthier and demanding more services, and slow productivity growth in this sector meant that to provide these services it had to pull in the workers shed by industry. Both push and pull forces were present in both periods. But, pull factors (i.e., the increased demand for services) was the predominant cause of decreasing industrial output and employment before World War II while push factors (i.e., rapid productivity growth in industry and slow productivity growth in services) dominated after the war. The decline in manufacturing output and employment is a long-run phenomenon, not just a short-run problem. This means that policies designed to boost manufacturing need to be designed with this long-run trend in mind, and not just react to problems of the last 10 to 20 years. Neither tax cuts nor tougher trade policy address the demand for more and varied services, nor will they address the relatively slow productivity growth in the service sector. Republicans like to cite the manufacturing job loss as being the problem but it's not. They cite environmental regulation and other regulations as being the problem but they're not. Republicans point to the high paying manufacturing jobs where unions secured the high compensation (e.g. Detroit automakers), not pointing to the Republican anti-organized labor states (e.g. where "right to work" laws exist) where wages for manufacturing jobs are plummeting, so even if we return more manufacturing to the United States they will be low paying non-union, not high paying union jobs, manufacturing jobs under Republican economic policies. So even if we focus on returning (or creating) the low paying non-union Republican manufacturing jobs to the United States it would take 20 to 50 years and that doesn't do a damn thing for the Millennials or the following generations of workers and it doesn't address the vast majority of jobs in the United States in the service sector that will soon represent 80% of all the jobs. How do we increase compensation in the Service Sector is the only thing we should be addressing because that's the key to the loss of middle income jobs in the past, today, and in the future. When will Republicans face that simple fact. The "market" has forced compensation down so far that people are either marginal or completely unable to support themselves based upon the compensation employers provide based upon the market. If we don't fix under-compensation (compensation less than the cost of living) in the service sector (that will be matched in the manufacturing sector under Republican anti-organized labor efforts) then the necessity for government welfare (that Republicans hate) is going to increase because eventually we'll end up with the Republican economy of the super-rich and the super-poor with virtually no one in between. Last edited by ShivaTD; Today at 08:50 AM.. There's another important fact that's often ignored. Large corporations are often cited because of the very large percentage of the GDP they represent and the large percentage of all income (annual wealth) that is funneled into the bank accounts og the very few investors in these corporations but they're a very small percentage of businesses in the United States. U.S. Census information from 2008 identified a total of 27,281,452 businesses in the United States. The number of businesses operated by proprietors with no employees numbered 21,351,320. Add to this the number of businesses having fewer than 500 employees and the number of small businesses comes to 27,262,983. Subtract this number from the total number of businesses identified by the census and reach the total number of businesses with more than 500 employees: 18,586. It turns out that calculating all businesses up to 1,500 employees makes no substantial difference in the percentage calculations. Small business amounts to 99 percent of businesses in the United States. We seem to forget that 99% of all businesses are "small" businesses and that they employ about 70% of all workers but only about 60% of the annual wealth creation is going to them. 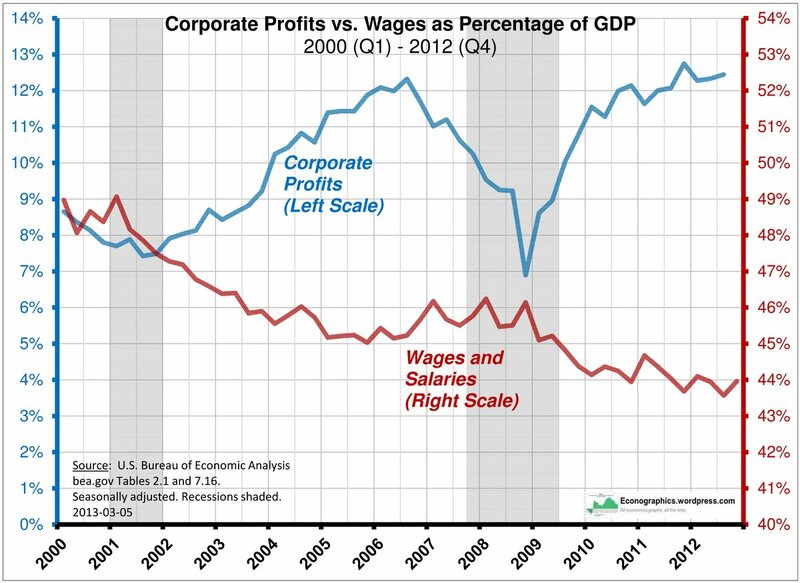 In the meantime large corporations only represent about 1% of all enterprises, they do employ about 30% of the non-government workers, but they also funnel up to 40% of all the wealth created into the pockets of less than 1% of all the people. The highly disproportionate wealth distribution is a direct result of Republican "pro-corporation/pro-investor" economic agenda (crony capitalism) and that favoritism inherently creates a negative economic impact to the small business owners and workers in the United States. The millennial's that work for me are making much more than this baby boomer did at their age. None of them went to college, but they are making more than most college grads. They are very happy working for a conservative republican like myself, that kept them working through the biggest construction collapse in the country. And now we are bidding jobs like crazy, getting ready to make ourselves even MO money. Viva Las Vegas! Yeah Obama really helped his corporate cronies didn't he? They made all that money, but they were not willing to invest under his administration. They are starting to invest now. Watch the construction market, that is where it starts. Yeah Obama really helped his corporate cronies didn't he? They made all that money, but they were not willing to invest under his administration. They are starting to invest now. What evidence do you have of this claim? Or is this yet another "repeat the lie often enough and people will believe it" moment?